All four referendums – including the repeal of nuclear power – passed in an historic vote in Italy on June 12 and 13, 2011, with about 55% of voters participating. With the Italian system requiring a quorum of at least 50% + 1 of eligible voters, this is the first time in 16 years that a referendum has passed in Italy. Initial tallies show that all 4 referendums passed with an overwhelming majority of over 95% of participants voting to repeal the existing laws. The 4 referendums were to repeal laws put in place by the Berlusconi government and repealed the decision to build nuclear power plants on Italian soil, privatize public water utilities and allow private water companies to recoup their investments by billing consumers, and last but not least repealed the “legitimate impediment” law that allowed a prime minister and other government ministers to postpone any court proceeding while in office. The “legitimate impediment” law was considered by it’s detractors as a law made by Berlusconi for Berlusconi, given that the controversial prime minister is currently a key figure in 4 separate court trials with charges ranging from corruption to child prostitution. The referendum victory comes on the heels of two important victories in local elections in Milan and Naples, where alternative left parties won the mayoral seats, and is seen as a further weakening of Berlusconi’s coalition. 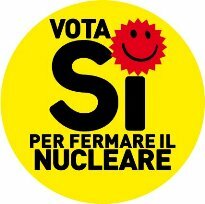 The pro-referendum campaign “Vota Si” – Vote Yes – overcame many obstacles including the government’s decision to put the referendum to the vote in a time period when many Italians could be away from home on summer vacation and unable to vote, to trying to negate the nuclear power referendum by instituting a 1-year moratorium on building nuclear power plants. This was overturned in court and the referendum went forward. Referendum victory celebrations are expected all over Italy, and I personally popped the cork on a bottle of Ferrari spumante to celebrate this important victory for democracy that hopefully will signal the eventual disappearance of the Berlusconi government.